Please refer to our stock # TCR6849 when inquiring. 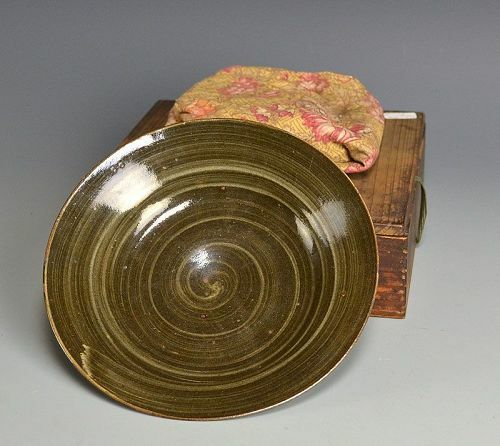 A very rare Nana-sun plate with swirling hake-me design from the kilns of Utsutsukawa dating from the early to mid Edo period wrapped in a ragged bit of sarasa dyed cotton cloth and enclosed in an age darkened wooden box titled Utsutsukawa-Yaki Kashibachi - Ikko (Sweets dish-1) It is 7-1/2 inches (19 cm) diameter. Thinly potted, there is a tiny chip in the rim, otherwise is in perfect condition; exceedingly rare for this type of pottery. Utsutsukawa-yaki originated in Nagasaki in the late 17th century. It is said it began when Tanaka Gyobusaemon opened a kiln around 1690. It is characterized by brown orange clay with a heavy iron content and was most often decorated with Brush strokes in white slip. Although at one time it was called the Ninsei of the West, the manufacture lasted only about 50 years due to the financial aspect of the clan, and it disappeared until the Meiji period, when there was an attempted revival, but that too failed to last. In modern times the art was revived by Yokoishi Gagyu, and has been named an important cultural property of Nagasaki Prefecture.